Can any flexible display have holes through? In order to make displays flexible, the transistor backplane technology used needs to be flexible. This is currently made possible using conventional silicon technology or metal oxides on bespoke polyimide substrates. Flexible displays need to be mounted onto glass in order to keep them flat during fabrication. At the end of the process the flexible displays need to be demounted from the glass carrier by using a laser de-bonding process. Holes can be cut through the displays before or after the de-bonding process. If the demounting process is aggressive, like in the case of laser de-bonding for the polyimide-based displays, it can generate unwanted stresses which will cause the edges of the holes to be concentrated stress relief areas and hence impact yield and cost. 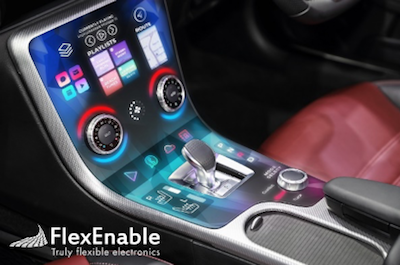 FlexEnable has developed a different approach for flexible displays. By using low temperature processing of organic thin-film transistors (OTFTs) on low cost plastics like triacetyl cellulose (TAC), no laser de-bonding processes are required. Instead a mild heat or UV treatment is used to separate the flexible displays from the glass. Holes through the displays are laser profiled while the displays are still mounted onto the glass. Unlike polyimide-based displays, OTFT displays have a simple high yielding demounting process. There will continue to be applications that require the use of knobs and buttons even if they feature touch-enabled displays. Imagine a car’s central console which is a touch–enabled display, but the volume dials and gear stick protrude through the display. As kitchen appliances become smarter with the use of displays, they may still require physical dials to control certain functions. Wearables like smart watches can combine the digital look of a smart watch with the mechanical dials of a conventional arm watch. As the landscape for flexible displays evolves with new use cases, the ability to cut holes through the displays unlocks even more design freedom and enables bolder product designs to meet growing consumer expectations. For more information on our flexible display technology please get in touch with FlexEnable at info@flexenable.com.